Site Report Pro allows you to import projects that have been exported from Site Report Pro. These may be for reasons of restoring a previously backed-up project, or another Site Report Pro user may be handing their project over to you. The process of importing will vary depending upon where the project has been exported to. 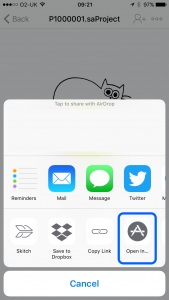 Examples of how to import when you receive a project as an attachment in an Email or a Dropbox share are shown below. 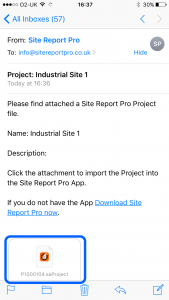 Open the mail application on your device and locate the e-mail containing the Site Report Pro project file. Click (or in some cases it may be necessary to press and hold) on the Site Report Pro application icon. 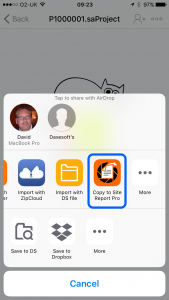 Click the Site Report Pro icon (copy to Site Report Pro) in the menu that appears. The project will now be imported and displayed on the projects screen. 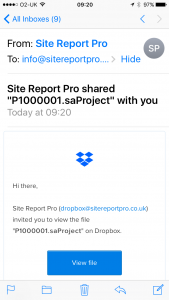 In the email you have received from Dropbox, click the View File button. 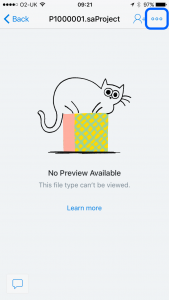 The dropbox App will open and display the ‘No Preview Available’ screen. Click the More button (3 dots). 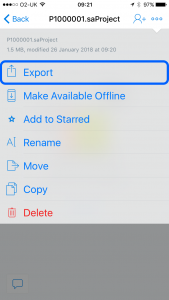 Click the Export button from the drop down menu. Click the Open In button on the pop up menu. Click the Copy to Site Report Pro button on the second pop up menu. To learn how to export a project from Site Report Pro view the Export Project article.